Wanna the best video formats for editing, playing, or uploading? Surely we need the different ones for different media players or editing tool, right? In this case, we are going to offer you the available ways of converting any video formats to others such like MKV, AVI, MOV, MP4 for playback or further editing and sharing. Which is available for free to download and use, VLC media player has supports many audio and video file formats and compression methods. It has an inbuilt feature to convert any known video file format to other format. That we are going to see here. If you don’t have a VLC Media Player then you can download it from the link given below. Now navigate to the “Media” and then click on “Convert/Save”.Now click on “Add” and choose a video file which you want to convert. Then click on “Convert/Save”. 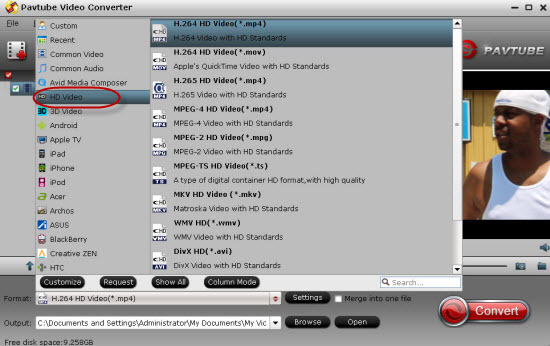 Here I’m going to convert mkv to mp4 but you can choose any video file which you want to convert. For example, you can convert mkv to avi, avi to mkv, avi to mp4 and vice versa,etc. Choose the output file format profile from the drop down list. As I’m converting MKV to MP4, I have selected mp4 profile. If you want to convert video to mp3 then select “Audio – MP3″ profile. Now click on “Browse” to set up output path. Select the folder where want to save the file. Give the proper file name to an output file. Don’t forget to give the output file extension. Now click on “Save”. That’s it. To check an output file go to the folder where you have saved it. This is one of the easiest and simplest method to convert any video file to other format including mp3. You can use the same technique to convert mp4 to wmv. Part 2.Pavtube Video Converter for Windows/Mac—Suit for any video’s conversion! Firstly, add the files in when you have downloaded and opened the program on your computer with ‘Add files’ or ‘Add from folder’ on the main interface. Then we need to go to the output list to find the suitable output ones as we need there. Such as the ‘HD Video’ item, you may not miss the most common video formats there. Or drop down the list, you can directly find the best for media players or editing tools. Look the following screen shot here. As you have chosen the right item, why not go to the ‘Settings’ or ‘Edit’ for some adjustments for output videos? No matter for the video size, frame rates or something else, you can set them freely there. Or go back to the main interface, hit the big button ‘Convert’ to start the work. Much easier than the VLC media player, right? It is deserved to have a try! Hi, I think this is a great web site. I stumbledupon it. I’m going to return yet again since i have book-marked it. You may take a look at this step by step guide, it’s about how to convert video between AVI, WMV, MP4, MPEG, 3GP, FLV, MOV, MKV, etc. It’s easy to understand and works pretty well for me. And the conversion quality is nice.